In light of the Global Financial Crisis nearly a decade ago, an outcry persists for ethical leadership in the business and finance world. This reality led Gordon’s leadership to ask an important question about how Gordon might make a deeper connection with the financial community in Boston—given that Gordon’s strategic situation near Boston makes it a prime location for developing a generation of technically proficient and civically minded leaders in the finance sector. Four and a half years later, the answer to such a question became manifest in the creation of Gordon’s Master of Science in Financial Analysis program (MSFA), which launched last night with a celebratory dinner for its inaugural cohort, and its first class. Around the dinner table were members of the cohort and faculty from the program, as well as President Michael Lindsay, Provost Janel Curry and Dean of Academic Initiatives and Global Education Jewerl Maxwell. The program’s executive director, Alexander Lowry, presided over the evening. Alexander Lowry, executive director for the Master of Science in Financial Analysis program, welcomes new graduate finance students in the Lion’s Den. The cohort moved from dinner to their first class, Christian Leadership and Business Ethics, which is taught by Professor in the Practice of Finance Gordon Hall ’81. The class features texts such as The Enron Collapse by Gregory Jenkins and Every Good Endeavor by Timothy Keller. Professor in the Practice of Finance Gordon Hall ’81 teaches the first graduate finance class at Gordon. 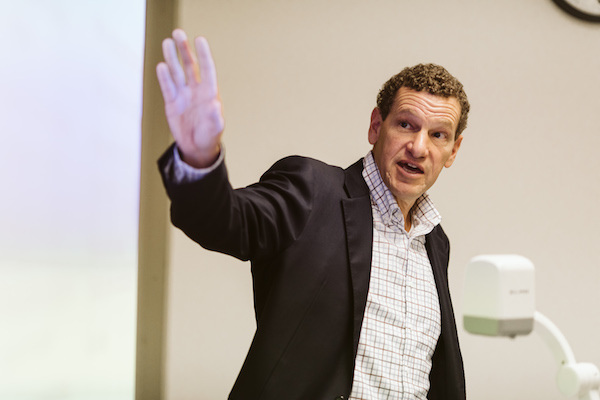 “This [program] offers our students a real foundation for ethics and integrity,” said Hall, before emphasizing the importance of drawing Christian scripture into dialogue with secular business ethics. Like Cassia, undergraduate students can begin working towards an advanced degree as early as the spring semester of their senior year as a part of Gordon Plus, which also includes graduate leadership, graduate education and graduate music. Maxwell hopes that especially young undergraduates—whether inside or external to the Gordon community—come to see Gordon Plus as a way to make the most of an early graduation. Moving forward, Lowry sees a bright future for Gordon’s commitment to developing leaders in the financial sector post-graduation. Applications for both the full-time and part-time cohorts launching in August 2018 are now open. 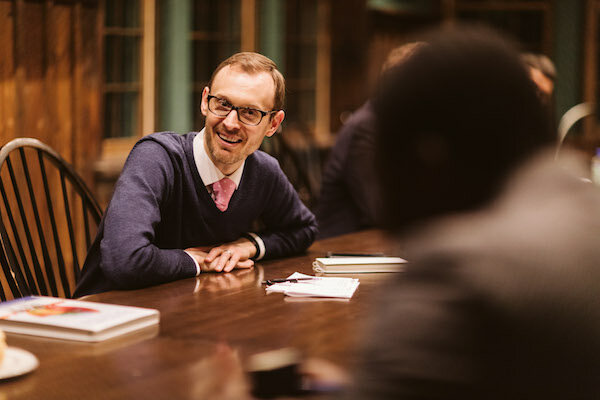 With the aim of involving Gordon alumni and Christian finance professionals, Gordon is establishing the Finance and Faith Forum—a community of Christians in finance—which is hosting its first event on March 21 at LogMeIn headquarters in Boston. For more information about the MSFA and the Faith and Finance Forum, email graduatefinance@gordon.edu.